Android email is working again! Several weeks ago Sprint updated my Nexus S 4G to Jelly Bean, and my Exchange email/calendar/contacts have been dead since. 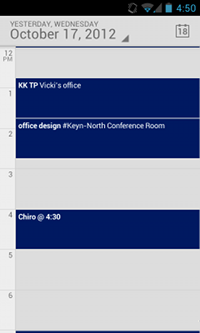 I didn’t realize how much I depended on having my calendar in my pocket! I finally found this thread, and tried the simple steps in comment #78: enable autosync and recreate the account with the default setting of “push” until things start working. Success! Email and calendar are working! (Still verifying contacts). This entry was posted in tech, tips&tricks on October 18, 2012 by karl.kranich. Ha! Don’t ya just love it when the solution appears buried somewhere in the comments? And of course, it broke a few hours later. It seems like I need to keep autosync turned on and sometimes need to press “sync” a few times to get past a security error.